because zinn has long been a source of inspiration and admiration, I have read many tributes and obituaries over the last couple days; this reflection by james carroll, a columnist for the boston globe, best captures why so many of us are drawn to professor zinn: "Howard had a genius for the shape of public morality and for articulating the great alternative vision of peace as more than a dream. But above all, he had a genius for the practical meaning of love." thank you professor zinn. rest in peace. today's song makes me think of professor zinn. lisa gutkin of the klezmatics, performs woody guthrie's gonna get through this world. woody wrote this song in 1945, however it took until 2003 before the world would hear it. after woody's death in 1967, his daughter nora established the woody guthrie archive in order to keep woody's music alive. since 1998 nora has worked with a variety of musicians to set music to many of the songs woody wrote that are in the archive. the klezmatics cd wonder wheel is the most recent of these collaborations. (youtube has another version of this song but you have to go here to listen/see it). The Dem-Now reflection had interviews with Chomsky and others reflecting on Zinn.......I didn't see the other program and thought this was put together after he died. I came looking for Sepia Saturday but I think I've found something better. 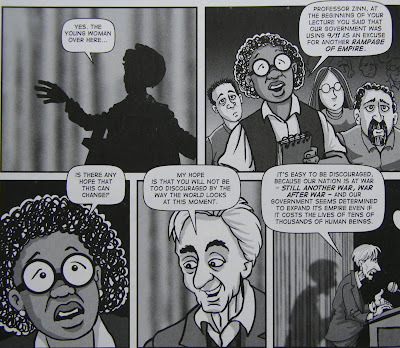 A wonderful tribute to Howard Zinn! Thank you.